Can partnerships and community-based conservation reverse the decline of coral reef social-ecological systems? The marine aquarium trade has played an important role in shaping the ecological state of coral reefs in Indonesia and much of the Asia-Pacific. The use of cyanide by ornamental fishers in Buleleng District, Bali, in the 1980s and 1990s has resulted in a precipitous decline in the ecological health of reefs. Cyanide-free harvesting techniques were introduced after 2000, along with reef restoration measures. This paper examines social and ecological processes in the fishing village of Les, Bali, in ending the use of cyanide and the resulting ecological restoration. An emphasis on conservation-development (with livelihood objectives) was important in securing interest and cooperation across stakeholder groups. Adaptive approaches to governance and knowledge co-production were also important. The strategy used at Les is now being exported to other communities across Indonesia, and provides a promising example of a marine resources-based conservation-development initiative that may be implemented at other, similar communities. As with many ecosystems, the world’s coral reefs are in a state of crisis (Bellwood et al. 2004), but it is also possible under some circumstances to move beyond “gloom and doom” and restore coral reef ecosystems (Hughes et al. 2010). It is more constructive to think of communities as potential stewards (rather than destroyers) of coral reefs. Empowering and educating local people is recognized as a crucial step towards the protection of coral reefs (Hughes et al. 2010). But crucially, environmental stewardship depends on a sense of ownership of the resource by the local people. Under such conditions, and under a legal framework safeguarding local rights, community-based conservation becomes possible (Berkes 2007). The paper deals with coral reef damage from ornamental fishing using cyanide. The global trade in marine fish for aquariums started in the Philippines. Cyanide fishing for ornamental fish spread from the Cebu area, where the technique has been used since 1962, to other parts of Southeast Asia (Rubec et al. 2001). Some 80% of the trade in recent years has involved exports from the Philippines and Indonesia to the USA (Shuman et al. 2004). Cyanide fishing has received attention because it inflicts damage on coral reefs at a time when coral reef ecosystems are under other environmental stresses (Hughes et al. 2010). Initial observations in 2006 in two communities in Bali, Indonesia, indicated that these areas had been using cyanide and had suffered degradation of coral reef ecosystems and declines in coastal livelihoods, according to fishers themselves. The crisis triggered two responses in the communities: first, harvesters agreed among themselves to stop using cyanide and adopted an alternative technique; second, once the use of cyanide stopped, reef restoration started. Communities developed partnerships with non-governmental organizations (NGOs) to take conservation action, but fisher representatives made it clear that their efforts were not merely for conservation in the scientific sense but for improved livelihoods (Berkes 2010a). The degradation-and-subsequent-restoration of coral reefs in Bali is an exciting story in illustrating the conditions under which success is possible, but the initial observations were not sufficient to track the development of the case, what exactly motivated the fishers and just how they were able to get assistance. A resource crisis may serve as a trigger to motivate communities to seek sustainable solutions (Seixas and Davy 2008), but there are additional factors to consider. These include commons institutions (or lack of them), mobilizing collective action, and issues of resource rights (Ostrom 2005). Moving to a solution likely involves social learning, a change in understanding that goes beyond the individual to become situated in groups or communities of practice (Wenger 1998; Armitage et al. 2011). Understanding critical factors requires case study analysis, complementing the line of inquiry to discover the conditions under which community conservation and management work, by using large-N studies and statistical approaches (Cinner et al. 2012). The cyanide story permits a qualitative analysis of the major factors to consider in the transformation of a community from one that (nearly) destroys its resources to one that rebuilds and protects them. Our research objectives were (1) to identify processes of change and restoration from the fishers’ point of view, and (2) to understand the role of knowledge transfer and partnerships in reversing ecological decline. The paper starts with the context of the case to examine how cyanide use associated with the marine aquarium trade precipitated an ecological crisis in Bali’s coral reefs. The social drivers behind the ecological transformations are examined, as well as the ways in which fishers and other stakeholders addressed the resource crisis. A Habermasian framework is then used to examine some of the key factors to build resource-centered adaptive governance that may be applicable to this and other similar social-ecological situations. The study was carried out in Buleleng District, Bali, Indonesia. Data collection occurred at 11 different coastal communities across Buleleng (Figure 1). The primary community of focus was Les, where the bulk of the data was obtained. Les (properly, Desa Les) is located at approximately 8°08’08” S, 115°22’10” E, roughly 4 km from Tejakula (the Sub-district Seat), and 35 km from Singaraja (the District Seat). The community has some 7450 residents, and is predominantly Hindu (>99%) (Ministry of Interior [Indonesia] 2009). Like many rural communities in Indonesia, the population is characterized by a high proportion of young individuals, <25 years of age. A summary of the main livelihood activities for the community is presented in Table 1. Geographically, the north coast of Bali is characterized as dry, relative to the southern part of the island. Due to the presence of volcanic mountains immediately to the south, the land resources are characterized by steep slopes, resulting in limited farmland and relatively low amounts of water available for agriculture (Zuryani 2006). The shoreline and adjacent seafloor across Buleleng varies, with some regions dominated by sand, and others by large rocks (as at Les). The bathymetry along the eastern portions of the north coast is steeper than in the west, reaching depths of 30–40 m within 100 m of the shore. These features combine to restrict the livelihood options available to residents, as farmland and coral reef resources are limited. Human damage to coral reefs in Buleleng, as across the Indo-Pacific in general, stems from a range of activities, including physical damage from ships and fishing activities (Jaap 2000), coral mining (Reksodiharjo-Lilley and Lilley 2007), blast fishing (also referred to as bomb or dynamite fishing), and pollution and sedimentation (Yahya et al. 2008). Despite such negative impacts, respondents indicated that at the beginning of the 1980s the majority of reefs in the study area were in healthy condition overall. Cyanide use, which began in the region after the mid-1980s, is closely associated with the damage to coral reefs caused by the marine aquarium trade (Jones and Steven 1997; Rubec et al. 2001). This highly toxic, rapidly absorbed compound inhibits cellular respiration in animals, and is lethal at high concentrations (Simeonova and Fishbein 2004). Ornamental fishers use cyanide because it causes fish to become sluggish or even paralyzed (Pyle 1992), making them easier to catch. However, the high toxicity of cyanide can result in mortality of the target organisms after capture or even later, during distribution. Rubec et al. (2001) estimate that up to 90% of aquarium fish caught using cyanide may die before they reach the retailer. Exposure to cyanide also has devastating effects on coral reef communities in general. Because cyanide solution is squeezed onto the reef in a diffuse cloud, fishers cannot target single organisms. Consequently, non-target species and organisms are killed (Barber and Pratt 1998; Rubec et al. 2001), including the eggs and larvae of species desired by fishers (Mak et al. 2005). Overfishing in general results in further reduction of the species’ ability to reproduce itself (Pet and Pet-Soede 1999), and heavy fishing with certain types of gear can fundamentally alter habitats as well (Bellwood et al. 2004). Over time, the net effect is an impoverishment of ecosystems and the fishers who make their living from those ecosystems. The long-term effect of using cyanide on coral reefs is to reduce an ecosystem of high biodiversity and structural heterogeneity (Jaap 2000), to one of low biodiversity and structural homogeneity (Jones and Steven 1997). In many communities across Buleleng, the damaging activities and processes detailed above (namely, blast fishing, cyanide use and overfishing, and pollution and sedimentation) occurred simultaneously (Yahya et al. 2008). The ecological interplay of these features is schematically shown in Figure 2 to make the point that cyanide fishing is not a stress acting alone. The research was carried out in a participatory manner, undertaken cooperatively with local fisher and community groups, NGOs, local enterprises, and researchers from Bogor Agricultural University. The research was qualitative in nature, and collected primary and secondary data using a case approach. To collect and triangulate appropriate data, research methods included semi-structured and key informant interviews; participant observation and diving transects; focus groups; timeline reconstruction; document review (including NGO and community documents); and network diagramming. The total number of interviews, organized by location and respondent type, is given in Table 2. For most interviews and focus groups, a translator was employed, using a double-translation method (i.e., the interviewer’s questions were translated into Indonesian or Balinese, and the response was translated into English). This method allowed for a greater range of inquiry during interviews, as well as improved follow-up questions. Finally, the data obtained in the field were triangulated, verified, and crosschecked with the community and other stakeholders to confirm validity and accuracy. The marine aquarium trade, that is, the capture of and trade in ornamental marine species, first arrived in Les in 1982 with ornamental fishers from East Java, and precipitated drastic declines in reef health. Those fishers introduced the use of potassium cyanide or sodium cyanide (often called potas in Indonesian, and hereafter referred to as cyanide) to capture reef fish. A few individuals from Les learned the practice by observing the fishers from East Java, and subsequently became ornamental fishers themselves. In addition to damage caused by cyanide use, fishers at Les report that large amounts of branching corals were broken with metal hooks to retrieve organisms such as shrimp, which shelter in the coral. Fishers estimate that by 1990, up to 20% of branching corals had been damaged by this harvesting activity alone, and that up to 75% of all corals were dead. Another important source of damage was a global bleaching event caused by elevated seawater temperatures during 1997–1998, with mortality rates of coral in Bali reaching as high as 50% (Goreau et al. 2000). 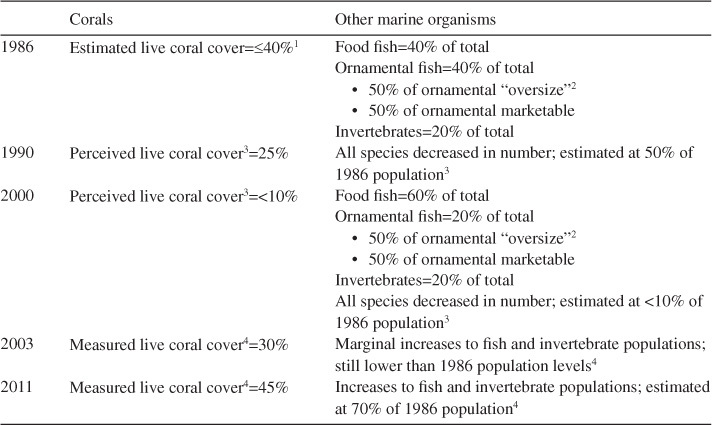 This ecological transition was accompanied by a precipitous decline in reef organisms, as reflected in Table 3. The table is a synthesis of the best available information on trends, but a major limitation of the data in the table is that they come from a mix of surveys and interviews. For example, the very low numbers for 2000 may reflect a bias in fishers’ estimates at a time when their livelihoods were threatened. User perceptions can differ from survey data, especially over time (Yasue et al. 2010). As one of the referees pointed out, a recovery from 10% to 30% live coral cover in 3 years (2000–2003) is unlikely given coral growth rates, and the numbers should be interpreted with caution. We consider that the data in Table 3 may be taken to indicate a low point in coral cover and biota around the year 2000, followed by recovery trends by 2003 and a recovery approaching 1986 levels by 2011. Additionally, the sharp decreases in ornamental fish stocks in the 1990s actually served to reinforce destructive behavior, due to the economic phenomenon of diminished supply with constant (or increasing) demand resulting in higher prices. Prior to the involvement of NGOs, not all fishers were aware of the effects of cyanide on coral reefs. Consequently, the damage observed on the reefs was often ascribed to some other cause, such as pollution, blast fishing, or coral bleaching events. Furthermore, because many fishers traveled away from their home communities to collect fish and other organisms, they did not observe long-term changes to any one particular reef. Conversely, some fishers working in remote locations were aware of the impacts of cyanide on coral reefs, but lacked a sense of “ownership” of the resource and were not concerned by the ecological problems to which they were contributing. Of the fishers who understood the impacts of cyanide and perceived the reefs to be in crisis, many were caught in a perceived dilemma of choosing between their “family or the reefs”. Many saw no option but to damage the reefs in order to earn a livelihood. As many fishers in Buleleng own no land and do not own a boat or other fishing gear, to turn away from ornamental fishing meant finding work as a wage labourer outside their village, perhaps as far away as Denpasar (about 3 hours from Buleleng). Meaningful alternatives to using cyanide were not available to ornamental fishers until 2000 when the first NGO arrived in Les to work on the coral reef problem. In many cases, it was from that organization that fishers in Les first became aware of the impacts of cyanide, and also learned new techniques for harvesting ornamental species without the use of cyanide. In 2000, an Indonesian national NGO, Yahasan Bahtera Nusantera (YBN), made inquiries with marine aquarium exporters to identify a target community with whom they might share environmentally appropriate ornamental fish capture techniques that relied on the use of barrier nets and hand-nets to capture fish (Yahya et al. 2008). YBN decided to work at Les because of the large number of fishers working there, about 100 in 2000. In order to capture fishers’ attention, YBN personnel entered Les posing as employees of a marine aquarium exporter who wanted to purchase fish caught without the use of cyanide. Because no fishers at that time had the necessary skills to catch fish without using cyanide, YBN offered to provide training in the use of nets. Initially, just two fishers were willing to learn the new techniques. Nevertheless, those fishers were closely observed by their peers, and over time, greater numbers of fishers expressed interest in learning the new techniques. The new harvesting techniques provided fishers with a sustainable alternative; although some fishers at Les had already become aware of the negative impact of cyanide on reef health (and their livelihoods), they had lacked alternatives prior to the arrival of YBN. The gradual increase in fisher awareness of the impacts of cyanide acted as the first trigger for social-ecological change at Les, motivated by a desire to improve livelihoods. The second trigger came in the form of new skills: some fishers desired an alternative and YBN provided it. When that alternative proved to be effective in providing incomes, greater numbers of fishers became interested in learning the new techniques. As fishers at Les and other parts of Buleleng engaged further with NGO personnel, researchers, government personnel and other actors, relationships of trust were built, and a shared vision emerged. YBN and later NGOs recognized the need to link a desire for ecological health of the coral reefs with the fishers’ desire for sustainable livelihoods. Training enabled fishers to envision sustainable livelihood opportunities, including not only those associated with the marine aquarium trade, but also coral reef ecotourism and other ancillary activities (Berkes 2010a). In 2001, an ornamental fishers’ association (Kelompok Nelayan Ikan Hias) was formed at Les. Even though not all ornamental fishers at Les became members of the fishers’ association, YBN was able train both members and non-members in the new harvesting techniques, as well as in improved fish handling techniques. Non-members also learned by observing members who had received training. With a critical mass of fishers switching to non-cyanide methods and exercising social pressure on the rest, cyanide usage was (almost) completely abandoned at Les by 2003. Also in 2003, YBN began collaborating with Marine Aquarium Council (MAC), a US NGO, and other NGOs. This collaboration allowed those organizations to broaden their vision and to begin reef restoration activities. Early coral reef restoration at Les involved growing coral fragments (nubbins) in shallow-water nurseries and transplanting them onto reefs. This strategy, however, is costly and labor-intensive, often relying on fishers’ volunteer labor, as observed in the field in 2006 (Berkes 2010a). Alternative strategies for reef restoration included the use of artificial reef structures (ARSs), typically made of concrete. These structures provide a textured surface upon which naturally recruited coral can settle and other organisms can grow; they also provide refuge for reef species, effectively creating a “micro-reef”. In 2009, an Indonesian NGO, Yayasan Alam Indonesia Lestari (LINI), developed three new types of ARSs, called “fish dome”, “roti buaya”, and “shrimp pot”. These structures have been installed in locations across Buleleng, and the production methods have been taught to local fishers at Les and other communities. The shrimp pot is particularly popular with fishers at Les, and as of March 2012, approximately 800 shrimp pots, 60 roti buaya, and 30 fish domes had been installed on the reef, or were under construction (Made Partiana, personal communication). Importantly, the use of ARSs allows fishers to work in a localized area, reducing the need to travel from reef to reef in search of ornamental species. The coral reefs at Les and other parts of Buleleng, as of 2012, had not completely recovered from the damage incurred over the decades; in some of the other fishing villages, damage has continued. Nevertheless, the events at Les demonstrate that it is within the power of communities and individuals to bring about positive ecological transformations. To better understand the transformations at Les, we use an adaptive collaborative framework analysis, with focus on governance for improved social-ecological outcomes. Governance is here used as the more inclusive term than management, not merely concerned with actions, but also involving politics, rights and responsibilities, and setting objectives and a policy agenda (Berkes 2010b), with an emphasis on trust-building, institutional development, and social learning (Armitage et al. 2011). Following Habermas (1981) and applying it to adaptive collaborative management (Prabhu et al. 2007), Berkes (2010b) suggested a conceptual framework consisting of three phases. The first phase is communicative action aimed at the generation of understanding, and includes deliberation and the role of leadership, sharing and clarifying values and knowledge, and creating a shared vision. The second phase, strategic action, is about self-organization and deals with relationships such as establishing communities of practice and networks. The third phase is instrumental action, which is the collaborative action that includes building institutions and social capital, capacity-building, and establishing enabling environments. This conceptual framework has been adapted here to help explain the complex and interrelated processes observed at Les. The model is meant to be exploratory (rather than predictive) for identifying key building blocks of adaptive collaborative management. The phases are not linear but overlapping, interconnected and cyclic (Berkes 2010b). At Les, the arrival of YBN initiated the communicative action phase. YBN communicated its vision of developing a cyanide-free and environmentally sustainable ornamental fishery at Les. Their message found a receptive audience, as many fishers were concerned about their livelihoods and some were beginning to make the connection to cyanide. The two fishers who initially cooperated with YBN and received training in cyanide-free methods played key leadership roles by vocalizing their support for the NGO’s new methods and encouraging other fishers to try them. Although they did not hold prominent positions within their community at that time, they were nevertheless well respected and trusted by their peers, and were able to provide firsthand evidence that the new methods were viable. In view of their strong ties to their community, their experiences generated debate and discussion. Their leadership and the deliberation they created was an important factor in the early success of YBN’s activities at Les, supporting other findings about the importance of leadership in commons management (Seixas and Davy 2008). The deliberative process at Les expanded in scope when the village authorities became involved. As additional actors, such as government personnel, researchers, and other NGOs, became part of discussions, the deliberative process became more comprehensive, reflecting the viewpoints and relative expertise of each actor. At Les, as at other communities in Buleleng, the process of sharing knowledge and values served to clarify the fishers’ relationship with the reefs, and provided fishers with an ecological basis for understanding how sustainable reef management practices can result in improved coral reefs and sustainable livelihoods. Prior to their interaction with NGOs, fishers at Les and across Buleleng did not fully understand the impacts of using cyanide on coral reefs, and lacked certain understandings of reef ecology. During meetings with fishers, the NGOs were able to directly address misconceptions about cyanide use, providing participants with the opportunity to share improved information among all participants (Stern 2005). Importantly, conceptual understanding was combined with practical skills training, such as the use of hand-nets and coral restoration practices. This likely had the effect of presenting information in a meaningful manner (especially as many fishers have minimal formal education), and of keeping the fishers engaged in the learning process (Habermas 1981; Mezirow 1997). It gave the fishers a chance to put their observations and knowledge together with new knowledge, in effect, knowledge co-production (Armitage et al. 2011). It also provided fishers with information they were capable of passing along to other fishers in the form of applied knowledge. The processes described in this section did not occur overnight; neither did they involve participants arriving at a common understanding simultaneously. Some fishers were quicker than others to explore new avenues of thought and modes of practice. Others were slower to change, and were often only willing to change when their peers’ actions proved to be successful. Some fishers opted to seek alternative livelihoods (such as labourers) rather than learn the new methods. This differing response of fishers to change is likely a reflection of different preferences for risk-taking, based on broad socioeconomic factors (Eggert and Lokina 2007). Although the number of ornamental fishers at Les changed over time, with individuals entering and exiting according to personal circumstances, they were nevertheless loosely organized. Wenger’s (1998) communities of practice concept, which emphasizes learning-as-participation, appropriately captures the state of fisher organization at Les, even before the formal creation of an ornamental fishers’ association. Consequently, it was with these pre-existing informal communities that NGOs worked. As Ostrom (2005) and Prabhu et al. (2007) point out, working with existing institutions is the most practical approach. Fishers and other community associations are widely established in Indonesia in general, and reflect in part the government’s policy to encourage such institutions (Satria and Matsuda 2004; Satria et al. 2006). A Community-based ornamental fishers’ organization was created in 2001 partly in anticipation of the fundamental changes that fishers and NGOs hoped to put into effect in Les. The fishers’ association provided a forum in which fishers could exchange views and ideas towards a shared vision, and where new knowledge could be shared in an efficient manner. The fishers’ association also provided outsiders (such as government staff, researchers, and NGOs) with a representative body with whom they could interact, and the physical space in which to conduct interactions. The creation of a shared vision for resource governance resulted in the empowerment of local resource users in Buleleng. In the process of talking with partners and developing new skills, ornamental fishers gained insights into how to work collaboratively towards improving their coral reefs, and many developed a new sense of ownership of the resource, as well as confidence in interactions with both fishers and non-fishers. The participatory, reflexive approach to governance described above is characterized by a complexity of linkages, relying on numerous players and institutions in the form of networks (Seixas and Berkes 2010). Some linkages and networks were already in place at Les prior to the arrival of YBN and other NGOs. However, the number and arguably, the intentionality (Wenger 1998) of networks increased after 2000. Based on a focus group with fishers from Les and LINI staff, Figure 3 provides a picture of linkages and networks at Les and across Buleleng. The networks included fishers from various communities; local, national, and international NGOs (with linkages to funding agencies); government personnel (MMAF and OAP) at national and local levels (which provide important resources, and also receive technical training from NGO marine scientists); entrepreneurs (such as tourist operators and fish exporters); and researchers. Networks were frequently overlapping with players from multiple networks, and tended to evolve over time. For example, there is overlap and exchange between NGOs in terms of personnel, skills training, policies and goals; such redundancy is considered important for providing resilience (Seixas and Berkes 2010). The number of linkages and complexity of networks increased after 2000 (Figure 3b), illustrating the importance of individual organizations (or clusters of organizations) in facilitating exchange. Notably, the appearance of local and international NGOs in the network radically changed the number of linkages, as well as the way in which actors interacted. Similarly, as the role of ornamental fishers from Les in teaching and sharing new techniques to other fishers expanded, the importance of that community within the network also grew. Finally, the involvement of local and international NGOs appears to have created linkages between ornamental fishers and the consumer (end purchaser). While this linkage (as of 2012) is a weak one, the potential exists for it to become an important means for improved international understanding of sustainability of the marine aquarium trade. Within the ornamental fishing communities where LINI works, the NGO has taken care to identify individuals with whom they can network directly. Two such individuals from Les (both in their mid-20s in 2000) can be characterized as “boundary people” – that is, prolific networkers with contacts across different levels of linkages and across communities. One of these individuals has since relocated to another community, where he teaches sustainable harvesting techniques. The other maintains an active role at Les and in ornamental fishing communities across Bali. As noted in participant observation research, communication by mobile phone has greatly facilitated connectivity, with boundary people easily contacting fishers, for example, for arranging meetings and accessing information. At the time when ornamental fishers still used cyanide at Les, the institutions, or rules-in-use (Ostrom 2005), concerning property rights over coral reef resources were only loosely defined, and fishers routinely engaged in activities that may have been perceived as destructive. Furthermore, fishers routinely fished in other communities’ waters, where rules-in-use were also poorly defined. As fishers learned new harvesting techniques from NGOs, and as their skills improved, they collectively decided to establish a cyanide-free fishery and an ornamental fishers’ association at Les. Although technically supported by Indonesian law, both the cyanide-free fishery and the fishers’ association remain informal institutions. Essentially, the critical glue for these institutions is social capital, a concept that describes the interconnected concepts of trust, reciprocity, shared rules, norms and sanctions, and connectedness (Pretty and Ward 2001; Pretty and Smith 2004). Although some monitoring by Indonesian Ocean and Air Police occurs in the area, enforcement is mainly social. Fishers express the belief that they can trust one another not to use cyanide – a belief that is supported by a shared understanding that fishers can now catch greater numbers of desirable species using cyanide-free techniques. If a fisher were to be caught using cyanide on the reefs at Les, they would be warned once; if the infraction were to occur again, that individual would be turned over to the authorities. However, according to fishers at Les, no warnings have been necessary to date. Nevertheless, not all communities in the research are able to establish cyanide-free fisheries. In these communities, some fishers use new techniques, while others continue to use cyanide. This situation begs the question of whether institutions remain effective if they are only being adhered to be a portion of resource users, i.e., the free-rider problem of commons. Clearly, in these locations, both ecological gains and the development of social capital are compromised. Fishers and local distributors in communities where cyanide use continues watch for opportunities to educate cyanide users in the new approaches, and illegal fishing activities are sometimes reported to the authorities. However, fishers expressed the view that they prefer to maintain positive, neighborly ties with all fishers, in hopes of developing trust relationships to bring violators eventually on side. Les has been the focus of significant capacity-building efforts. Following the successful transfer of cyanide-free techniques, NGOs began to develop fishers’ overall capacity to manage their newly established institutions, and to network with others. Working closely with the fishers’ association, LINI has provided other fishers with training on teaching methods, assessing the ecological health of coral reefs (such as conducting reef surveys), and recording harvest data. As the quotation points out, in each community appropriate individuals are selected for capacity-building for leadership, communication, and technical capacity-building. Fishers at Les are encouraged by LINI to experiment with ARSs, varying the placement, configuration, and construction techniques. As the ecological and commercial benefits of ARSs become increasingly evident to those in the marine aquarium trade, fishers have received requests for these structures from local fish distributors and exporters. Fishers at Les provide training on ARS construction, placement, and management to individuals and communities. Such training has the potential to provide fishers with additional income. Seixas and Davy (2008) point out that capacity-building may be necessary at times, not only for resource users, but also for NGO and government personnel and researchers. Capacity-building among professionals and practitioners (Berkes 2007) may benefit from the use of participatory methodologies. An example of capacity-building among practitioners is seen in the technical, scientific training provided to government personnel by LINI marine scientists. Knowledge gained from participatory methodologies plays an important role in informing policy-makers and legislators who may lack scientific backgrounds or hands-on experience with marine-related issues. Individual and community empowerment is central to successful co-management of marine resources (Pomeroy et al. 2001; Cinner et al. 2012). At Les, fishers have considerable latitude in economic decision-making, with the ability to receive purchase orders from and sell to three local buyers, and several others in the area. On a village and regional level, ornamental fishers at Les have been afforded the social and political scope to make decisions and take action. The ability of resource users to establish their own rules-in-use, as well as to enforce these rules, is critical (Ostrom 2005) and may be supported by enabling legislation and government policies (Folke et al. 2005). Only then communities have a sense of ownership of their resources and can practice stewardship. User participation is often found in societies with democratic traditions and strong civil society (Berkes 2010b). It is likely that Les, like many communities in Bali, has strong traditions of deliberation and democratic decision-making. For example, Korn (1960), in his seminal anthropological work on Balinese village institutions, refers to the Balinese village as a small, independent republic and an egalitarian political community. Examples of this egalitarian ethic were observed during public meetings to address community concerns, such as social or environmental issues, where individuals are encouraged to speak in turn. Decisions affecting the community tend to be made through lengthy deliberations and consensus-building. It is possible that the success of efforts to transform reef use at Les were at least partly attributable to this cultural feature of Balinese society. The events at Les provide a striking example of a marine resource brought to the brink of collapse, but restored to relative health through collective action – by the same community. Cooperation at Les did not always proceed smoothly and events described in this paper did not occur without periods of difficulty and disappointment. Even though the transition at Les can be characterized as relatively conflict-free, many communities where reefs have been damaged have experienced more contentious transitions, and (as of 2012) still wrestle with the issue of cyanide use. Other, non-cyanide-related pressures (such as pollution, coastal development, and global warming) remain serious long-term threats to coral reef systems. Nevertheless, real gains have been made at Les and at some other communities, and the manner in which they were achieved provides important insights into how to proceed in other, similar situations. As fishers at Les developed cyanide-free harvesting skills and techniques for effective communication, they took upon themselves a role in the dissemination of the new techniques to fishers in other villages. The transformation back to relatively healthy reefs can be depicted as a Habermasian process of adaptive collaborative management in three phases: communicative action, strategic action or self-organization, and instrumental or collaborative action (Berkes 2010b). The important processes and components include deliberation, knowledge co-production (Armitage et al. 2011), social learning in communities of practice (Wenger 1998), networking (Seixas and Berkes 2010), institution-building (Ostrom 2005), and capacity-building. Communities and ornamental fishers lack secure legal rights to their resources and the cyanide ban is enforced locally by social means. Despite this, the case shows that reef degradation can be reversed (Hughes et al. 2010), but this requires strong commons institutions and a sense of ownership of the resource, without which traditions of stewardship cannot develop. We are thankful for the generosity and cooperation of Les and other ornamental fishing communities in Buleleng District, as well as the assistance of LINI. The advice and assistance of Dr. Arif Satria of Bogor Agricultural University and his team were much appreciated. Frey’s work was supported by an SSHRC grant to Drs. Derek Armitage and Berkes. Berkes’ ongoing work has been supported by the Canada Research Chairs program (http://www.chairs-chaires.gc.ca). Armitage, D, Berkes, F, Dale, A, Kocho-Schellenberg, E and Patton, E (2011). Co-management and Co-Production of Knowledge: Learning to Adapt in Canada’s Arctic. Global Environmental Change 21: 995–1004. Barber, C and Pratt, V (1998). Poison and Profits: Cyanide Fishing in the Indo-Pacific. Environment 40: 4–9. Bellwood, D, Hughes, T, Folke, C and Nyström, M (2004). Confronting the Coral Reef Crisis. Nature 429: 827–833. Berkes, F (2007). Community-Based Conservation in a Globalized World. Proceedings of the National Academy of Sciences 104: 15188–15193. Berkes, F (2010a). Linkages and Multilevel Systems for Matching Governance and Ecology: Lessons from Roving Bandits. Bulletin of Marine Science 86: 235–250. Berkes, F (2010b). Devolution of Environment and Resource Governance: Trends and Future. Environmental Conservation 37: 489–500. Cinner, J McClanahan, T McNeil, M Graham, N Daw, T Mukminin, A et al. (2012). Comanagement of Coral Reef Social-Ecological Systems. Proceedings of the National Academy of Sciences 109: 5219–5222. Eggert, H and Lokina, R (2007). Small-Scale Fisherman and Risk Preferences. Marine Resource Economics 22: 49–67. Folke, C, Hahn, T, Olsson, P and Norberg, J (2005). Adaptive Governance of Social-Ecological Systems. Annual Review of Environment and Resources 30: 441–473. Goreau, T, McClanahan, T, Hayes, R and Strong, A (2000). Conservation of Coral Reefs After the 1998 Global Bleaching Event. Conservation Biology 14(2): 5–15. Habermas, J , . Theorie des Kommunikativen Handelns. Frankfurt (Germany): Suhrkamp. 1981. Hughes, T. P, Graham, N. A. J, Jackson, J. B. C, Mumby, P. J and Steneck, R. S (2010). Rising to the Challenge of Sustaining Coral Reef Resilience. Trends in Ecology and Evolution 25: 633–642. Jaap, W (2000). Coral Reef Restoration. Ecological Engineering 15: 345–364. Jones, R and Steven, A (1997). 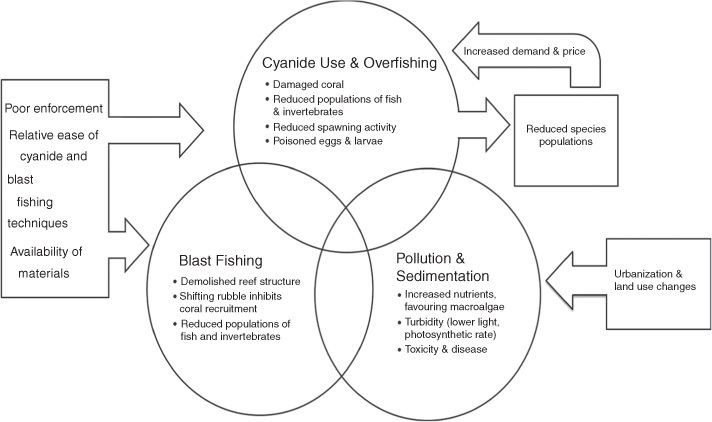 Effects of Cyanide of Corals in Relation to Cyanide Fishing on Reefs. Marine Freshwater Research 48: 517–522. Korn, V. E , ; The Village Republic of Tenganan Pegeringsingan. In: Wertheim, Willem F., editor. Bali: Studies in Life, Thought and Ritual. The Hague: W. van Hoeve, 1960. p. 301.-368. Mak, K, Yanase, H and Renneberg, R (2005). Cyanide Fishing and Cyanide Detection in Coral Reef Fish Using Chemical Tests and Biosensors. Biosensors and Bioelectronics 20: 2581–2593. Mezirow, J (1997). Transformative Learning: Theory to Practice. New Directions for Adult and Continuing Education 74: 5–12. Pet, J and Pet-Soede, L (1999). A Note on Cyanide Fishing in Indonesia. SPC Live Reef Fish Information Bulletin 5: 21–22. Pomeroy, R, Katon, B and Harkes, I (2001). Conditions Affecting the Success of Fisheries Co-Management: Lessons from Asia. Marine Policy 25: 197–208. Prabhu, R, McDougall, C and Fisher, R , ; Adaptive Collaborative Management: A Conceptual Model. In: Fisher, R, Brabhu, R and McDougall, C eds. , editors. Adaptive Collaborative Management of Community Forests in Asia. Bogor: Center for International Forestry Research (CIFOR), 2007. p. 16.-49. Pretty, J and Ward, H (2001). Social Capital and the Environment. World Development 29: 209–227. Pretty, J and Smith, D (2004). Social Capital in Biodiversity Conservation and Management. Conservation Biology 18: 631–638. Pyle, R , . Marine Aquarium Fish, FFA Report 92/55. Honiara: Pacific Islands Forum Fisheries Agency. 1992. Reksodihardjo-Lilley, G and Lilley, R (2007). Towards a Sustainable Marine Aquarium Trade: An Indonesian Perspective. SPC Live Reef Fish Information Bulletin 17: 11–19. Rubec, P, Cruz, F, Pratt, V, Oellers, R, McCullough, B and Lallo, B (2001). Cyanide-Free Net-Caught Fish for the Marine Aquarium Trade. Aquarium Sciences and Conservation 3: 37–51. Satria, A and Matsuda, Y (2004). Decentralization Policy: An Opportunity for Strengthening Fisheries Management System?. Journal of Environment and Development 13: 179–196. Satria, A, Matsuda, Y and Sano, M (2006). Contractual Solution to the Tragedy of Property Right in Coastal Fisheries. Marine Policy 30: 226–236. Seixas, C and Berkes, F (2010). Community-Based Enterprises: The Significance of Partnerships and Institutional Linkages. International Journal of the Commons 4: 183–212. Seixas, C and Davy, B (2008). Self-Organization in Integrated Conservation and Development Initiatives. International Journal of the Commons 2: 99–125. Shuman, C. S, Hodgson, G and Ambrose, R. F (2004). Managing the Marine Aquarium Trade: is Eco-Certification the Answer?. Environmental Conservation 31: 339–348. Simeonova, F and Fishbein, L , . Hydrogen Cyanide and Cyanides: Human Health Aspects. Geneva: United Nations Environment Programme, International Labour Organization, World Health Organization (UNEP, ILO, WHO). 2004. Stern, P (2005). Deliberative Methods for Understanding Environmental Systems. BioScience 55: 976–982. Wenger, E , . Communities of Practice: Learning, Meaning and Identity. Cambridge (UK): Cambridge University Press. 1998. Yahya, Y, Widyastuti, P and Mustain, A , . Marine Aquarium Fisheries in Buleleng District, Bali Province: Report on Coral Reef and Reef Fisheries Survey 2003–2007 and Marine Aquarium Catch/Harvest Data Monitoring 2005–2007. Sanur: Indonesian Nature Foundation (LINI). 2008. Yasué, M, Kaufman, L and Vincent, A. J. C (2010). Assessing Ecological Changes in and around Marine Reserves using Community Perceptions and Biological Surveys. Aquatic Conservation: Marine and Freshwater Ecosystems 20: 407–418. What are important sources of livelihood for your family? When did you become an ornamental fisher? Was cyanide already in use by fishers at that time? If so, how did you learn? What was the condition of the reefs when you began ornamental fishing? Were there other destructive practices or factors at the time? If so, what? When did you begin to notice damages to the reef? Were you aware of the impact of cyanide on coral reefs? When and how did your thinking about cyanide use begin to change? Did NGO(s) come to this community? If so, when did they first come? 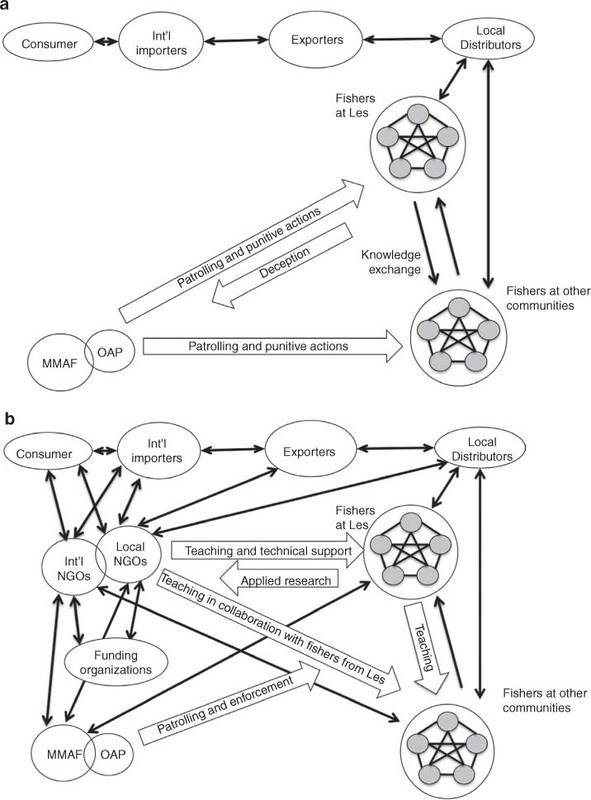 How did the relationship between local fishers and the NGO(s) begin? How did training in the new techniques and/or coral reef restoration occur? What was the content of the training? What was your impression of the new information and techniques? How did using the new skills impact your income? Do some ornamental fishers at this community still use cyanide? If so, is that ever a source of conflict? How do you sell the fish you catch? Are there any restoration activities on this community’s reefs? If so, what? Are there indications that the reefs are [ecologically] changing over time? If so, what? Have fishers from this community been engaged in training activities for fishers in other communities? If so, where? What is the function of the ornamental fishers’ association in this community? What are the formal and informal networks that exist between this community (or organization) and other communities or organizations. What type of training have ornamental fishers from this community (or staff from this organization) provided to fishers elsewhere? How were those skills transferred? What continuing capacity-building activities occur in those communities? How has the use of cyanide-free techniques impacted fishers’ livelihoods? How has the use of cyanide-free techniques impacted the reef? How has the use of artificial reef structures impacted the reef? What role does fisher-led experimentation have in the use of artificial reef structures? What are the future plans of the community (or organization) with regards to training fishers and reef restoration? Overlapping sources of damage to coral reef systems and social drivers of sources. Each circle represents geographic areas (namely, village-level territorial waters) where a type of damage occurs to reefs; overlapping circles represent areas where more than one type of damage is present. Comparison of networks at Les, Buleleng, (a) before the arrival of NGOs; and (b) after. Black, two-headed arrows represent linkages with exchange of information in two directions. White arrows indicate important sources of information and other inputs. The diagrams shown here are based on diagrams developed during a focus group with ornamental fishers and NGO personnel (and is not based on a questionnaire). 1At Les, 16 of approximately 50 active ornamental fishers at were interviewed. Official figures for the total number of ornamental fishers at other communities in Buleleng were not available, but were observed to vary from as low as one individual to twenty or more. 2“Other” includes marine aquarium fish distributors; entrepreneurs; researchers; community organizers; and spouses of fishers. “It’s my family or the reefs” Fishers identify ecological problems for reefs, but lack alternatives. They are willing to exchange the long-term health of coral reefs to meet immediate financial needs. “The real culprit is…” Fishers perceive ecological problems for reefs, but fail to identify cyanide use as one of the causes. Other causes of damage, such as pollution, blast fishing, and climate change (bleaching) are blamed instead. “It’s somebody else’s reef” Fishers identify the ecological problems associated with cyanide use; however, because they often travel to other communities to collect fish, they lack a sense of ownership of those problems. They are willing to pass the problems along to another community. “But prices are rising” Fishers identify ecological problems for reefs caused by cyanide use and overfishing, but continue to use cyanide because of strong financial incentives. This perspective stems from the economic phenomenon of diminished supply resulting in higher price.